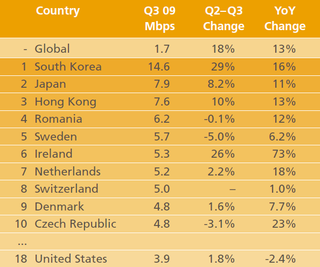 Akamai released their quarterly State of the Internet report this week, along with this chart showing the fastest national networks in the world. From 2008 to 2009, on average, the world's internet got 13% faster. America's got 2.4% slower. There are tons of interesting tidbits to be found in Akamai's State of the Internet report for Q3 2009. This particular chart shows the 10 countries with the fastest internet in the world. It also shows that they're not slowing down. South Korea, already pumping at 14.6 Mbps, managed to improve 16% over last year. Ireland improved most dramatically of the top ten, improving their infrastructure to increase year over year speeds 73%. But America, who has the 18th fastest internet in the world, slowed down ever so slightly to 3.9 Mbps in 2009. Though our nation as a whole didn't get any faster, some individual areas showed significant improvement, including a 20% bump in Massachusettes and a 17% jump in D.C. and Utah.